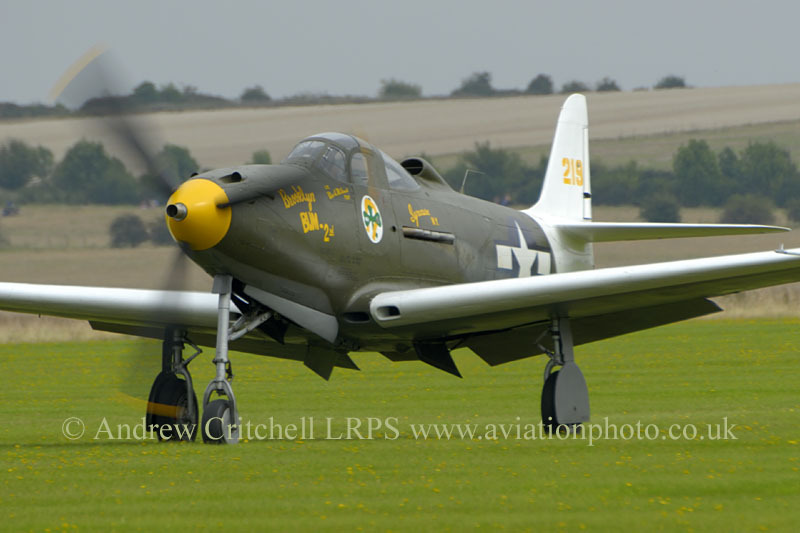 Bell Airacobra. In 1937, the United States Army Air Corps issued a specification for a new fighter via Circular Proposal X-608. It was a request for a high-altitude interceptor aircraft having "the tactical mission of interception and attack of hostile aircraft at high altitude". Specifications called for a maximum airspeed of at least 360 miles per hour (580 km/h) at altitude, and a climb to 20,000 feet (6100m) within 6 minutes; the toughest set of specifications USAAC had presented to that date. Other competing designs included the Curtiss P-40, an outgrowth of a previous design, and the Lockheed P-38, which utilized a complex twin-engine twin boom configuration. Although Bell's limited fighter design work had previously resulted in the unusual Bell YFM-1 Airacuda, the Model 12 proposal adopted an equally original configuration with an Allison V-12 engine mounted in the middle of the fuselage, just behind the cockpit, and a propeller driven by a shaft passing beneath the pilot's feet under the cockpit floor. The main purpose of this configuration was to free up space for the heavy main armament, a 37 mm Oldsmobile T9 cannon firing through the centre of the propeller hub for optimum accuracy and stability when firing. In fact, the entire design was made to accommodate this gun in the aircraft. This happened because H.M. Poyer, designer for project leader Robert Woods, was impressed by the power of this weapon and he pressed for its incorporation though the original concept had been a 20-25 mm cannon mounted in a conventional manner in the nose. This was unusual, because fighters had previously been designed around an engine, not a weapon system. Although devastating when it worked, the T9 had very limited ammunition, a low rate of fire, and was prone to jamming. A secondary benefit of the mid-engine arrangement was to create a smooth and streamlined nose profile. The weight distribution necessitated a tricycle undercarriage, a first among American fighters, though the Lockheed XP-38 was concurrently designed with tricycle landing gear. Entry to the cockpit was through side doors (mounted on both sides of the cockpit) rather than a sliding canopy. Its unusual engine location and the long driveshaft caused some pilot concern at first, but experience showed this was no more of a hazard in a crash landing than with an engine located forward of the cockpit. There were no problems with propshaft failure. As originally designed, the XP-39 had a turbocharger with a belly scoop (a feature shared by the XP-40); both were deleted for production. The XP-39 made her maiden flight on 6 April 1938 at Wright Field, Ohio, achieving 630 km/h at 6100 m (390 mph at 20000 ft), reaching this altitude in only five minutes. The Army ordered twelve YP-39s for service evaluation and one YP-39A with the turbo-supercharger deleted. 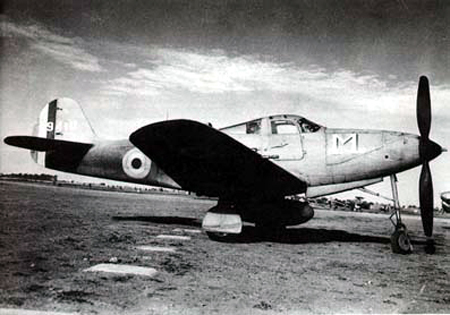 After these trials were complete, which resulted in detail changes including deletion of the external radiator, and on advice from NACA, the prototype was modified as the XP-39B; after demonstrating a performance improvement, the thirteen YP-39s were completed to this standard, adding two 0.3" (7.62 mm) MG to the two .50s as well. Lacking armour or self-sealing fuel tanks, the prototype was 900 kg lighter than the production fighters. After completing service trials, and originally designated P-45, a first order for 80 aircraft was placed 10 August 1939; the designation would revert before deliveries began. The P-39 was an all-metal, low-wing, single-engine fighter, with tricycle undercarriage incorporating a very streamlined and aerodynamically efficient design. The Airacobra was conceived with the T9 gun in mind. This weapon fired a 610 gram projectile capable of piercing 2 cm (.78") of armour at 450 m (500yd) with armour piercing rounds. The complete armament fit as designed consisted of the T9 with a pair of Browning M2 .50" (12.7 mm) machineguns mounted in the nose. This would change to two .50s and two .30s in the XP-39B (P-39C, Model 13, the first 20 delivered) and 2x0.50 and 4x0.30 (all four in the wings) in the P-39D (Model 15), which also introduced self-sealing tanks and shackles (and piping) for a 500pd (227 kg) bomb or drop tank. The engine was placed behind the cockpit, so pilots often referred to this as "Allison armor." A long transmission tunnel passed through the fuselage, under the cockpit, and was linked to the three bladed propeller. The radiator was located in the fuselage. In September 1940, Britain ordered 386 P-39Ds (as the Model 14), of 675 in all, differing in the 37 mm being replaced by a 20 mm Hispano and the 6x0.3 by .303 (7.7 mm). 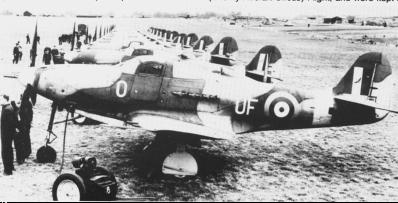 These began equipping 601 Squadron in September 1941, and were promptly recognized as having inadequate rate of climb and performance at altitude; only 80 joined the RAF (only 601 being outfitted), over 250 being transferred to the Red Air Force, about 200 repossessed by the Army after Pearl Harbour, and some 200 sent to Eighth Air Force in 1942 (the Army models being designated P-400). Because of the unconventional layout, there was no space in the fuselage to place a fuel tank. Although drop tanks were implemented to extend its range, the standard fuel load was carried in the wings, with the result that the P-39 was limited to short range tactical strikes. A heavy structure and around 120 kg of armour were characteristic of this aircraft as well. The production P-39's heavier weight combined with the poor performance of the Allison engine, limited the high-altitude capabilities of the fighter. 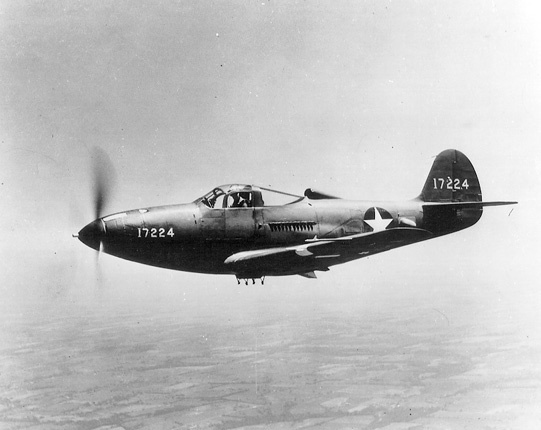 The P-39's altitude performance was markedly inferior to the contemporary European fighters and, as a result, the first USAAF fighter units in the European Theatre were equipped with the Spitfire V. However, the P-39D's roll rate was 75 degrees per second at 235 mph (378 km/h)– better than the A6M2, F4F, F6F, or P-38 up to 265 mph (426 km/h). see NACA chart). 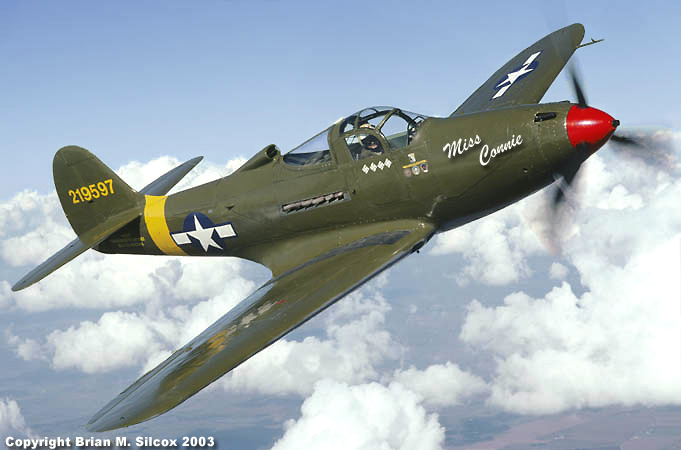 Above the V-1710's full throttle height of about 17,000 ft (5,000 m), the P-39's performance dropped off rapidly. This limited its usefulness in traditional fighter missions in Europe as well as in the Pacific, where it was not uncommon for Japanese bombers to attack at altitudes above the P-39's operational ceiling (which in the tropical hot air inevitably was lower than in moderate climates). 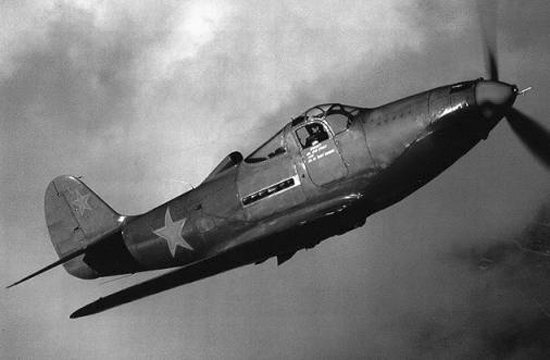 The weight distribution of the P-39 supposedly is the reason for its tendency to enter a dangerous flat spin — a characteristic Soviet test pilots were able to demonstrate to the sceptical manufacturer who had been unable to reproduce the effect. After extensive tests, it was determined the spin could only be induced if the plane was improperly loaded, with no ammunition in the front compartment. The flight manual specifically noted a need to ballast the front ammunition compartment with the appropriate weight of shell casings to achieve a reasonable centre of gravity. High speed controls were light thus high speed turns and pull-outs were possible although the P-39 had to be held in a dive since it tended to level out, reminiscent of the Spitfire. Redline dive speed was a respectable 525 mph (845 km/h) for the P-39. The rear-mounted engine made the aircraft ideal for ground attack since fire would be coming from the front-bottom quarter and was less likely to hit the engine and its cooling systems. However, the arrangement proved to be very vulnerable to attacks from above and behind and nearly any hit on the fuselage from an attacking enemy fighter was virtually guaranteed to disable the cooling system and lead to the prompt demise of the engine and thus the airplane. 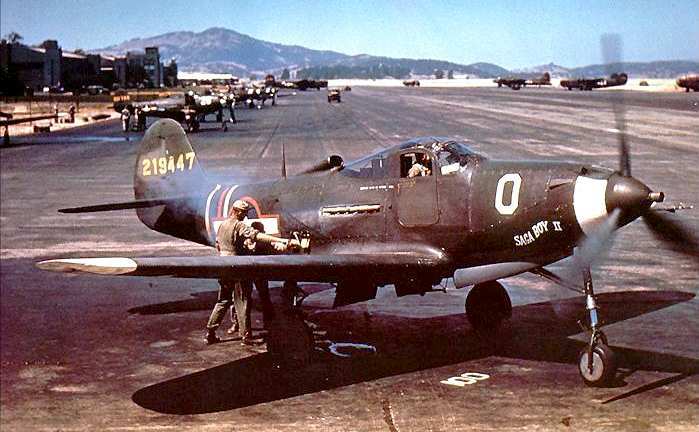 Coupled with lack of high-altitude performance, the Airacobra was extremely vulnerable to any enemy fighter with decent high altitude performance. A naval version with tail-dragger landing gear, the XFL-1 Airabonita, was ordered as a competitor to the F4U Corsair and XF5F Skyrocket. It first flew 13 May 1940, but after a troublesome and protracted development and testing period, it was rejected. By the time of the Pearl Harbour attack, nearly 600 had been built. When P-39 production ended in August 1944, Bell had built 9,558 Airacobras, of which 4,773 (mostly -39N and -39Q) were sent to the Soviet Union through the Lend-Lease program. There were numerous minor variations in engine, propeller, and armament, but no major structural changes in production types, excepting a few two-seat TP-39F and RP-39Q trainers. In addition, seven went to the U.S. Navy as radio-controlled drones. Trials of a laminar flow wing (in the XP-39E) and Continental IV-1430 engine (the P-76) were unsuccessful. 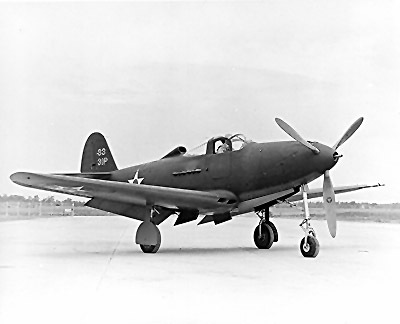 The mid-engine, gun-through-hub concept was developed further in the Bell P-63 Kingcobra. In 1940, the British Direct Purchase Commission in the US was looking for combat aircraft; they ordered 675 of the export version Bell Model 14 as the "Caribou" on the strength of the company's representations on 13 April 1940. The performance of the Bell P-39 prototype and 13 test aircraft which were able to achieve a speed of 390 mph (630 km/h) at altitude was due to the installation of turbo-supercharging. The British armament was 0.50-inch machine guns in the fuselage, and four 0.30-inch machine guns in the wings, the 37 mm gun was replaced by a 20 mm Hispano Suiza. The British export models were renamed "Airacobra" in 1941. A further 150 were specified for delivery under Lend-lease in 1941 but these were not supplied. The Royal Air Force (RAF) took delivery in mid 1941 and found that actual performance of the non-turbo-supercharged production aircraft differed markedly from what they were expecting. In some areas, the Airacobra was inferior to existing aircraft such as the Hawker Hurricane and Supermarine Spitfire and its performance at altitude suffered drastically. On the other hand it was considered effective for low level fighter and ground attack work. Problems with gun and exhaust flash suppression and compass were fixable. No. 601 (County of London) Squadron was the only RAF unit to use the Airacobra operationally, receiving their first two examples on August 6, 1941. On October 9, four Airacobras attacked enemy barges near Dunkirk, in the type's only operational action with the RAF. The squadron continued to train with the Airacobra during the winter, but in March 1942, it re-equipped with Spitfires. The Airacobras already in the UK, along with the remainder of the first batch being built in the US, were sent to the Soviet Air force. 1x 37 mm M4 cannon firing through the propeller hub at the rate of 140 rpm with 30 rounds of HE ammo. 4 x .50 cal (12.7 mm) machine guns. Rate of fire was 750 rpm x 1 gun in each wing, only 300 rpm each x 2 guns synchronized in the cowl. Ammo: 200 rounds per nose-gun, 300 per wing-pod. Built as part of an order of 170 Bell 14 Airacobra I, basically a USAAF P-39D. 80 of these aircraft were used by the RAF the rest were taken up by the USAAF, this aircraft was known to have been transferred to Russia and some were lost en route. The final fate of this aircraft is not known.